Docker containers are software containers that wrap software in a complete file system containing everything the software in question needs to run properly (for example, code, runtime, system tools, and system libraries). This guarantees that the software always runs the same way, regardless of environment. In addition, you can configure several containers to run on a single instance, without the overhead of starting and maintaining separate virtual machines. Docker containers enable you to run API Portal on any host operating system or cloud platform that supports Docker. For details on how to deploy your Docker infrastructure in the cloud, see the product documentation for your chosen third-party cloud platform or Platform as a Service (PaaS) environments, such as Amazon Web Services or IBM Bluemix. Because API Gateway and API Manager support Docker containers as well, you can run the full API Management solution to Docker. This makes it easy to quickly build, test, and run API Management solutions for standalone or high availability (HA) deployment. In this example, API Portal and MySQL containers are located on separate instances. If you want, you can also run API Portal and MySQL containers on the same instance. However, separating the containers on different instances allows for additional security measures. The end user uses a browser to access API Portal using the IP address and the port on the host machine running the API Portal Docker container. The host machine interacts with the API Portal container using the port 443 to secure the connection. 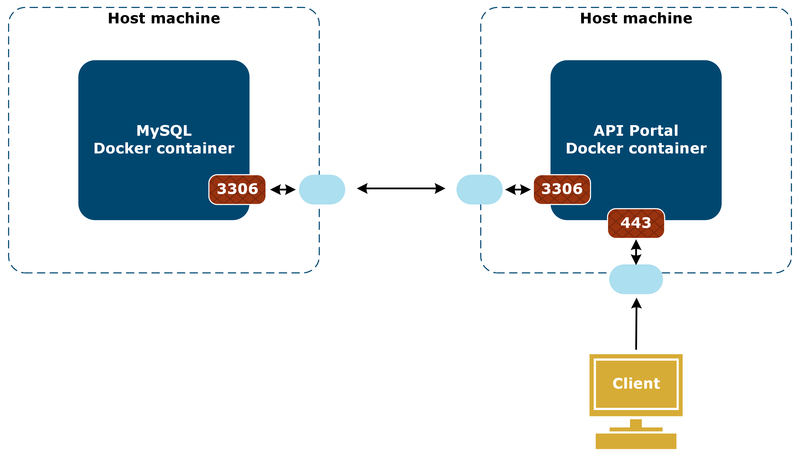 Behind the scenes, API Portal connects to the IP address and the port of host machine running the MySQL Docker container. The MySQL host machine uses the port 3306 to interact with the MySQL database in the cointainer. By default, API Portal uses the port 3306 for the MySQL connection and port 443 for httpd. To use different ports on the Docker containers, you can replace the default values in the code examples with the ports you want. Ensure that you define the same MySQL port in both the MySQL and API Portal container. Additional configuration may also be required. You can get the packages from Axway Support at https://support.axway.com. When you make changes that affect the file system of the API Portal container, such as customizations (template, logo) or changes to vhost file or .htaccess file, it is recommended to back up these changes. If you stop the container, all your changes are retained when you run the container again. If you remove the container, all your changes are lost, and you must either restore them from your backup, or redo them. For more details on MySQL in Docker, see the official MySQL Docker repository.